How many nods to the rest of the Star Wars universe did you notice in Rogue One? While I won’t go into any plot details, I will reveal some minor plot points below so if you haven’t seen the movie yet and want to see it completely spoiler-free, then don’t read on. I know I prefer to see a movie spoiler-free as tempting as it is to have a peek under the hood. However, if you’ve seen it or don’t care about minor spoilers, go ahead and let’s compare notes! I was surprised to see so many details of other Star Wars films, in particular A New Hope, woven into the fabric of this film. 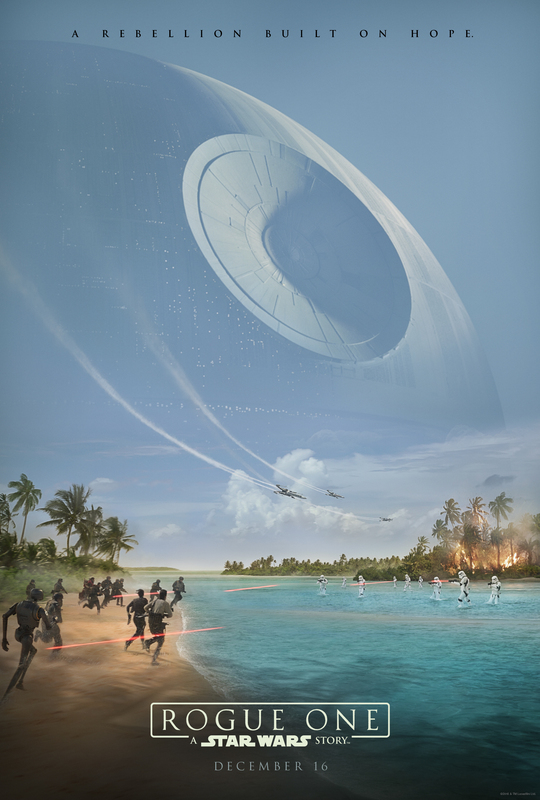 Obviously, Rogue One leads directly into it, but I was still amazed at the number of unexpected tie-ins. Some nods were obvious. The trailers featured Mon Mothma so seeing her was no surprise. Neither was seeing the Rebels camped out on Yavin-4. But seeing and hearing from Red and Gold Leaders was such a great nod. So was seeing Princess Leia as a young Carrie Fisher; Governor Tarkin with Peter Cushing’s face (who played a prominent role in the film); and a completely ruthless Darth Vader which made you appreciate more why he is the scourge of the galaxy. But watching the film did leave me with my top 5 questions about Rogue One. Probably many of you are smarter about this than I am so feel free to leave comments at the bottom. What other nuggets pass by so fast on screen that we don’t even notice them? I’m going to have to scour the Blu-Ray when it comes out! When did Hera get a promotion? – Assuming the passing reference in Rogue One is, in fact, to Hera Syndulla and not her father, there is background chatter in the Rebel base that says, “General Syndulla, report to operations.” Or something very close to that. Honestly, I got stuck on “General Syndulla.” It’s so nice to know that Hera survived from Star Wars Rebels. But what happened to Ezra and Kanan? And are Zeb, Chopper, and Sabine on board the Ghost with her? 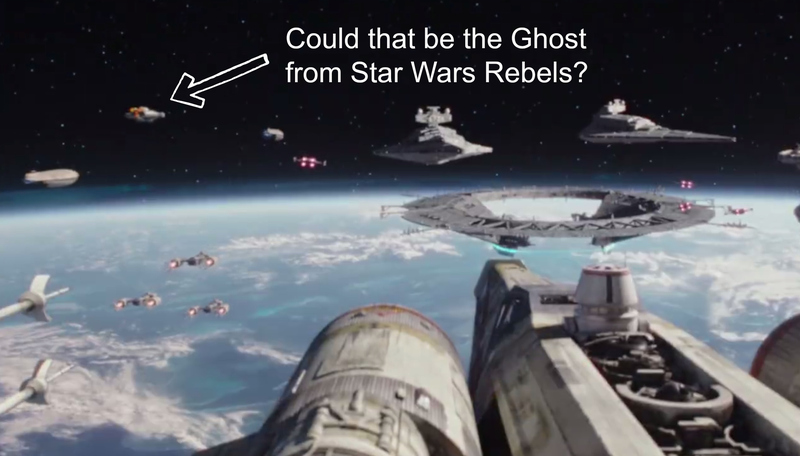 Someone on Facebook saw the trailer (posted above) and said, “Is that the Ghost?” And when I paused it, it certainly has the distinctive dual engines and angular profile of Hera’s ship. How did Ponda Baba and Dr. Cornelius Evazan get off of Jedha in time? – It was so cool to see the character I grew up knowing as “Walrus Man” in the film. And with both arms, too! Dr. Evazan looked as menacing and scary as ever though. But you have to wonder, with the devastation of Jedha being so complete, how did they escape? Maybe they were leaving when they bumped into Jyn and Cassian. 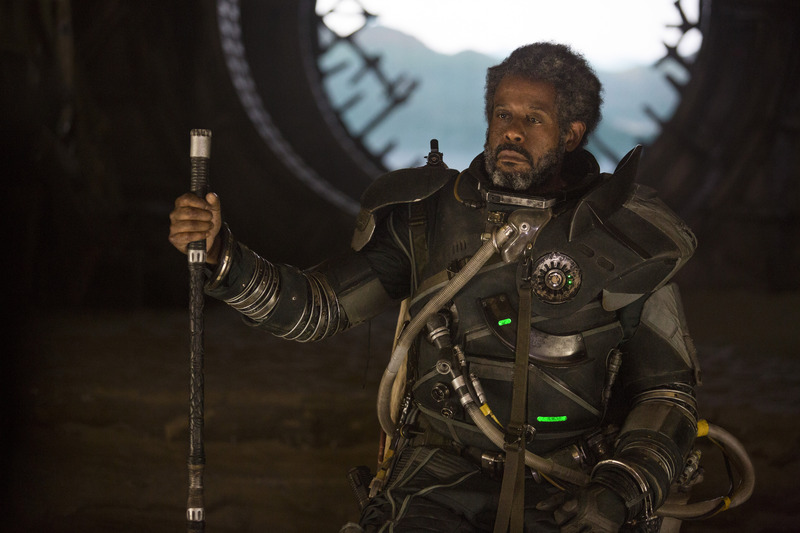 No matter what, it was great to see these classic cantina characters find their way into Rogue One. Why did they change “May the Force of others be with you” to “May the Force be with you?” – If you read the Dark Horse adaptation of George Lucas’ original screenplay for a movie then called “The Star Wars,” this phrase was prominently used in place of the widely known phrase we know and love. 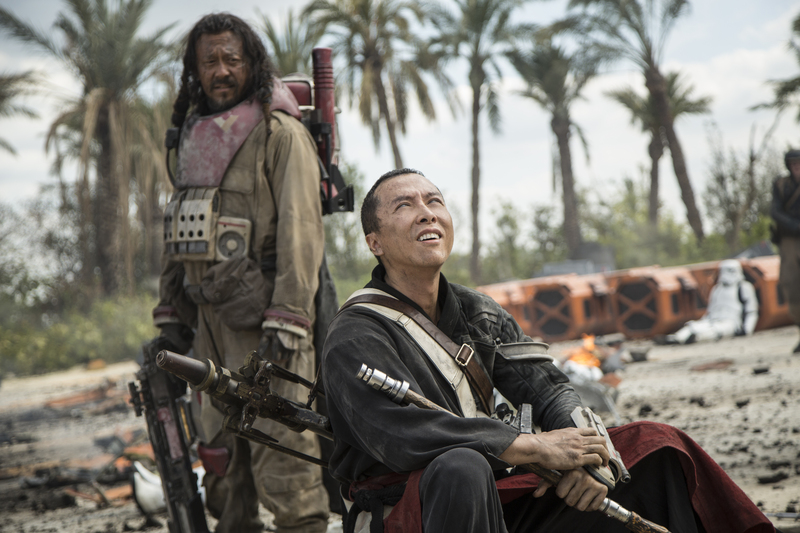 But when heard by Chirrut it has become canon. Still what is the difference? And if no difference, why drop those two words in the middle? It was great to see this bit of Star Wars trivia included in a canon movie. They could blow up a planet but are using graphics from the 1970’s? – I completely appreciate the continuity of using the graphics as seen in the original Star Wars movie, A New Hope, but I’m wondering if this new generation of Star Wars fans is asking why the Empire’s graphics are so poor. I guess building a Death Star takes away a lot of resources, including computer graphics. From a fan’s perspective, I was glad they didn’t update it. It makes sense when watching it in the context of the other films. Where was Wedge? – Was he on an undercover mission or something? And what about Admiral Ackbar? Was he promoted after the Battle of Scarif? As cool as it was to see people like Bail Organa and Mon Mothma and as great as it was to see Saw Gerrera become canonized with Forest Whittaker’s stunning and haunting performance, it was also mind-boggling to wonder where certain key figures like Wedge and Ackbar were. Maybe that’s for another Star Wars story? This was a great movie and in no way did these questions take away my enjoyment of the movie. Most of the time it heightened it! But what were the questions you walked away with?